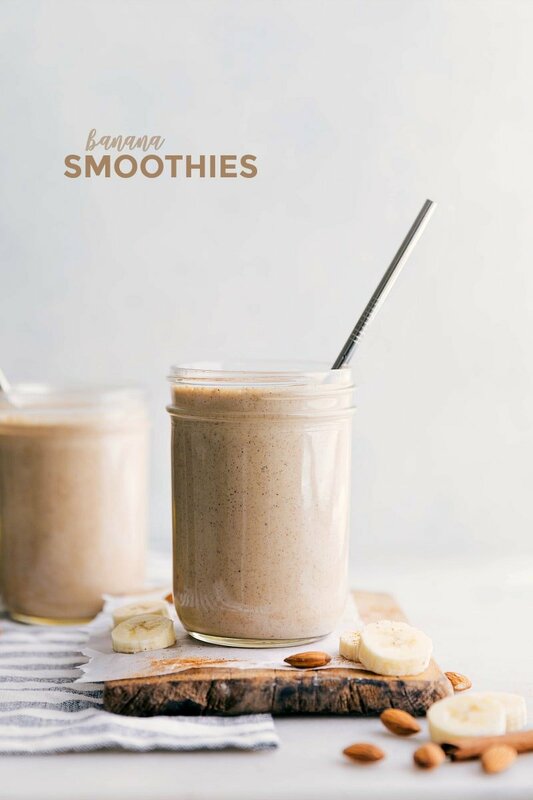 This Banana Smoothie takes minutes to whip together and only requires FIVE ingredients: frozen banana, milk, almond butter, vanilla, and a pinch of cinnamon. This smoothie is healthy, filling, creamy, and flavorful! It is also naturally dairy free and vegan. We’re obsessed with smoothies around these parts; they’re the perfect way to start your day or quell your sugar cravings! Be sure to try this famous acai bowl, the best green smoothie recipe, or this insanely good blueberry smoothie next. 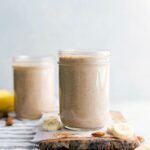 I never liked a “plain” banana smoothie (you know, without a million other fruits added in), until this recipe and now I’m HOOKED! This smoothie is packed with good ingredients, it’s smooth and creamy, and it’s so filling! If you like almonds and bananas, you will LOVE this smoothie. Freeze the banana: while this banana smoothie is simple to make, it does require just a bit of planning. I like to prep the bananas right after the grocery store so I don’t forget! 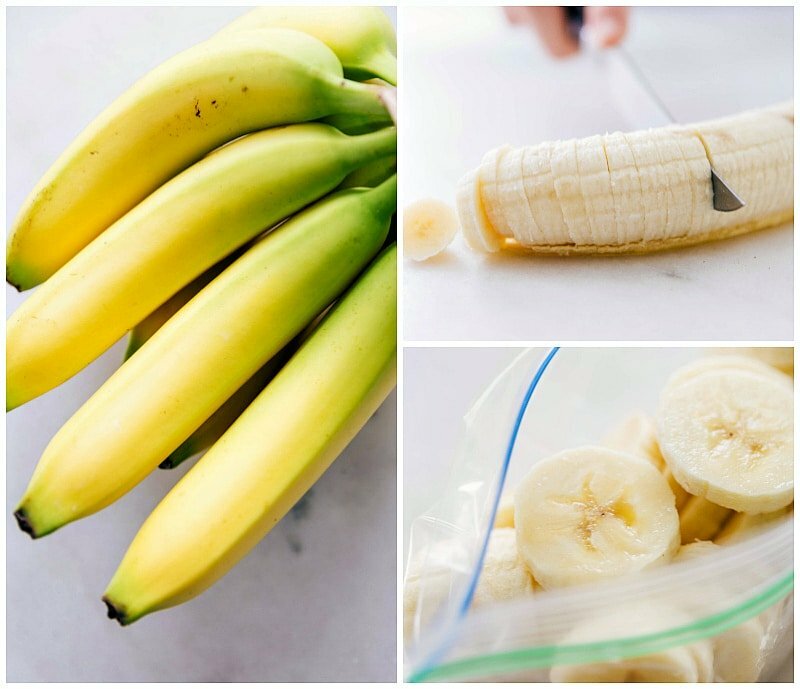 Remove the peel, slice the banana into coins, place in freezer safe containers or bags, and freeze overnight. Honestly, having a completely frozen banana (as opposed to an unfrozen one) is what MAKES this smoothie. Measure: while it might seem silly to actually measure out ingredients for a smoothie instead of just throwing everything in, I highly recommend measuring ingredients the first few times you make this or until you have a feel for the quantities. (Throwing random ingredients in a blender can often end up giving you WAY too much smoothie or tasting, well, nasty.) It’s also a good idea to measure if you’re tracking macros or calories. Blend: if you have a high powered blender (I recommend a Vitamix or Blendtec), you can add everything in and blend until smooth. If you don’t have a high powered blender, follow manufacturer instructions for what ingredients to add first to avoid cavitation. Taste: give it a quick taste and IF needed, add in a bit of sweetener. We rarely add in sweetener because the banana sweetens this so much, but the sweetness of bananas can vary (particularly depending on their ripeness). Banana smoothies are good for you! Almond butter: this nut butter is packed with vitamins, minerals, fiber, and protein. It also gives this smoothie so much flavor and increases the creaminess of it. The almond butter also helps to make this smoothie more filling. Vanilla almond milk: almond milk is low in calories and low in sugar while being high in calcium and other vitamins. Almond milk is also naturally dairy-free, vegan, and lactose-free. I like using vanilla flavored for an extra punch of flavor. Smoothies taste much better with milk than water! Cinnamon: this unassuming spice is loaded with health benefits! Cinnamon consumption is linked to a reduced heart disease risk and linked to lowering blood sugar. *While I do have my background in health, (BA Exercise & Wellness) I am not a doctor or certified nutritionist. Make sure to consult your doctor or certified nutritionist as needed. But wait, there isn’t ice listed in the ingredients for this recipe; what’s up with that?! Do you put ice in smoothies? Good ripe bananas make all the difference in this smoothie. Freeze the bananas when they’re ripe and use only when completely frozen for the best banana smoothie experience. How long can you keep a banana smoothie in the fridge? Generally a smoothie will keep about 8-12 hours in the fridge. A quick smell will clue you into knowing if the smoothie is okay or not. If you do plan on storing a smoothie, store it in a container with an airtight lid. 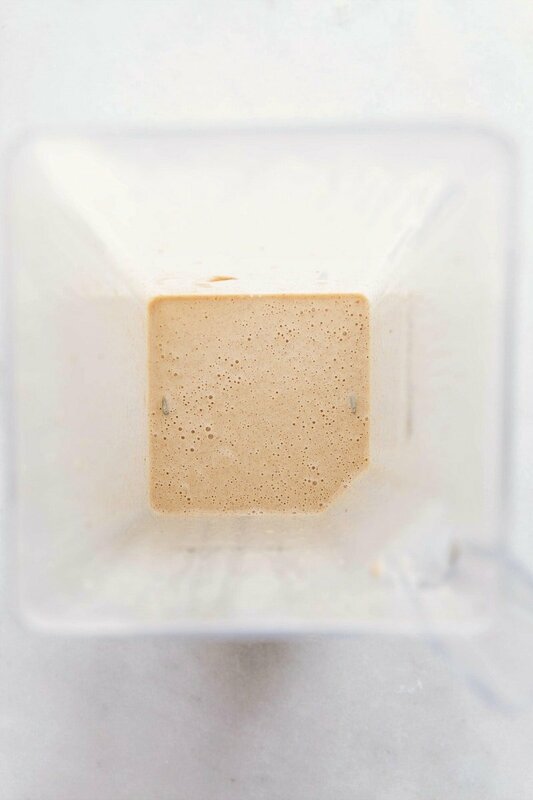 You’ll want to fill that container to the very top to prevent air being trapped in the container (this will oxidize (degrade) the nutrients in the smoothie). For this banana smoothie recipe, I recommend eating it all in one sitting preferably right after making it. I don’t find this smoothie sits or stores well. NIGHT BEFORE: Peel the banana and slice into coins. Place the coins in a sealed bag in the freezer the night before making this smoothie. * If banana isn't frozen solid, you'll want to add some ice to your smoothie. 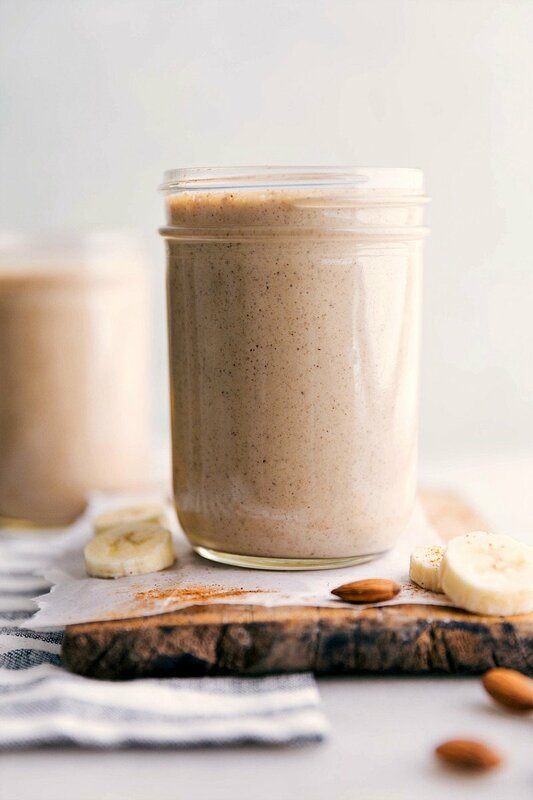 DAY OF: Combine the almond milk, frozen banana, almond or peanut butter, vanilla, and cinnamon in a large, powerful blender. Blend until completely smooth (about 60 seconds in a high powered blender). Note 1: you can use a different milk, just check and make sure it's dairy free if that's a concern. Looks like the perfect Mother’s Day breakfast, because after all these brunch ideas I’m seeing, I’d better cut calories somewhere! This looks like my kind of breakfast! Beautiful photos too! I love using frozen banana in smoothies. So creamy! This is just beautiful, Chelsea! The bright and clean photography is making me want to just grab a jar through the screen! 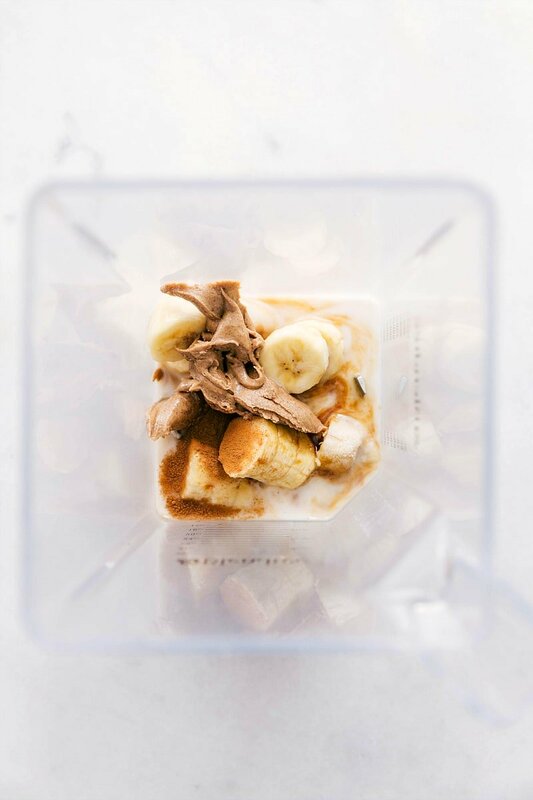 Mixing the frozen banana and the yogurt is genius! And your food styling is just gorgeous. I’m crushing on everything in those photos 🙂 You do an incredible job photographing frozen drinks – I find those so hard! Oh wow a drinkable version of key lime pie sound fantastic! I’ve been eating muffins and smoothies for breakfast lately and finally feel good about breakfast again! haha I was in such a rut! This looks awesome – I love throwing a handful of spinach in my smoothies! What gorgeous photos of this tasty smoothie! Pinned! Looks so refreshing, not to mention beautiful! Pinning for later use! I am SO hooked on Key Lime Pie yogurt! My fridge is always stocked with that flavor and the orange creamsicle… which I will sometimes freeze for fro-yo in the middle of summer. This smoothie has my name written ALL over it! This is such a fun idea for a smoothie! This would be a great thing to wake up to, Chelsea! Love key lime! I love your pictures and I love this smoothie so much! Great recipe, great photos. Pinned! Oh, I think I would rather have this for breakfast than the smoothie I’m drinking right now! Pinned! This smoothie sounds scrumptious, and a good substitute for folks with a sweet tooth who are trying to combat cravings! Smoothies are my favorite breakfast. The color of this alone would make me want to drink it. It’s so pretty! I would definitely have this in the morning…it’s like dessert for breakfast! And it has to be in a mason jar of course. It adds flavor without actually adding flavor, you know? I’d love to try this one! Your photography is beautiful as well and love the mason jar idea. Thanks for sharing on Tuesday Talent Show. Wow, this looks absolutely irresistible! I love starting my day off with healthy shakes that taste like dessert- I can’t wait to try it out! this was linked to a recent “best smoothies” recipe from Crazy for Crust, so had to check it out based on the title, hadn’t seen this before, inspired flavors! I will definitely try this smoothie recipe! Such a healthy meal! I will let you know what i think of your smoothie and how it tastes .can i put plain yogurt in this smoothie? I have a magic bullet blender with four cups that came with it in a box. 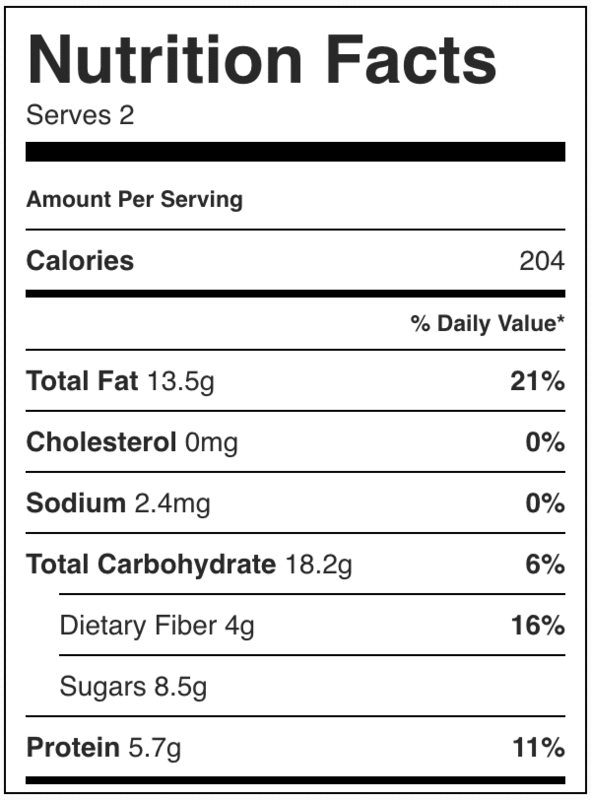 I am also a type 2 diabetic and i was wondering if this smoothie and your other smoothies are safe for diabetics. Hi, our banana smoothie looks so good and tasty.What is the nutrictional information in your smoothie recipe? I am a type 2 diabetic and i would like o know what the carbs and sugar content is before i make your smoothie in my magic bullet blender for 1 person . The banana smoothie you make is delicious and nutritious. I really like this smoothie. wow, that drink is delicious and nutritious.